At the time of its conception, the Canal Defence Light, or CDL, was a Top Secret project. This ‘Secret Weapon’ was based around the use of a powerful Carbon-Arc lamp and would be used to illuminate enemy positions in night attacks as well as disorient the enemy troops. A number of vehicles were converted to CDLs, such as the Matilda II, the Churchill, and the M3 Lee. In keeping with the highly secret nature of the project, Americans designated vehicles carrying the CDL as “T10 Shop Tractors.” In fact, the designation “Canal Defence Light” was intended as a code name to draw as little attention to the project as possible. Looking at the CDL tanks, one would be forgiven for thinking that they were one of the famous ‘Hobart’s Funnies.’ but in fact, the man credited with the creation of the Canal Defence Light was Albert Victor Marcel Mitzakis. Mitzakis designed the contraption with Oscar De Thoren, a naval commander who, like Mitzakis, had served in the First World War. De Thoren had long championed the idea of armored searchlights for use in night attacks and the project continued under the supervision of the venerable British Major General, J. F. C. “Boney” Fuller. Fuller was a noted Military historian and strategist, credited as one the earliest theorists of modern armored warfare. With Major General Fuller’s backing, and even the financial support of the Second Duke of Westminster, Hugh Grosvenor, the first CDL prototype was demonstrated to the French Military in 1934. The French were not keen, thinking the system was too fragile. The British War Office had refused to test the device until January 1937 when Fuller contacted Cyril Deverell, the newly appointed Chief of the Imperial General Staff (C.I.G.S.). Three systems were demonstrated on Salisbury Plain in January and February 1937. Following the demonstration which took place on Salisbury Plain, three more of the devices were ordered for tests. There were delays, however, and the War Office took over the project in 1940. Tests finally began and orders were placed for 300 devices that could be mounted to tanks. A prototype was soon constructed using a spare Matilda II hull. A number of Churchills and even Valentines were also supplied for the tests. The turrets were manufactured at the Vulcan Foundry Locomotive Works in Newton-le-Willows, Lancashire. Components were also produced at the Southern Railway workshops in Ashford, Kent. The Ministry of Supply delivered the Matilda hulls. The turrets were identified by Type, eg. Type A, B & C. The Ministry of Supply also established an assembly and training site known as the CDL School at Lowther Castle, near Penrith, Cumbria. The CDL was demonstrated to United States officials in 1942. Generals Eisenhower and Clark were present for the demonstrations. The American’s became intrigued by the CDL, and decided to develop their own version of the device. Designers chose the then outdated and plentiful M3 Lee Medium tank as a mount for the light. For the purposes of extreme secrecy, production stages were split between three locations. The Arc-Lamps being provided by the US Army Corps of Engineers, the American Locomotive Company, New York, worked on modifying the M3 Lee to accept the CDL turret and the Pressed Steel Car Company, New Jersey, constructed the turret as “Coastal Defence Turrets.” Finally, the components were united at the Rock Island Arsenal, Illinois. 497 Canal Defence Light equipped tanks had been produced by 1944. Crews were trained at Fort Knox, Kentucky, and in the huge Arizona/California maneuver area. Crews training with the vehicles – codename “Leaflet – went under the codename “Cassock.” Six Battalions were formed and would later join British CDL tank regiments, covertly stationed in Wales. American crews came to call the CDL Tanks “Gizmos”. 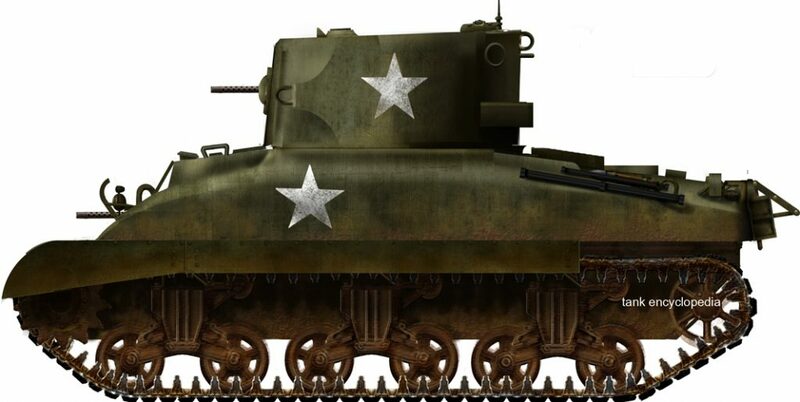 Tests would later begin to mount the CDL on the newer M4 Sherman chassis, developing their own unique turret for it, which will be explored in a subsequent section. The Carbon-Arc searchlight would produce a light as bright as 13 Million candle-power (12.8 million candela). Arc-Lamps produce light via an arc of electricity suspended in air between two carbon electrodes. To ignite the lamp, the rods are touched together, forming an arc, and then slowly drawn apart, maintaining an arc. The carbon in the rods vaporizes, and the vapor produced is extremely luminous, which produces the bright light. This light is then focussed by a large concave mirror. Using a series of mirrors to reflect it, the intensely bright beam of light passes through a very small vertical slit on the left of the turret face. The slit was 24 inches (61cm) tall, and 2 inches (5.1cm) wide and had a built in shutter that would open and close two times per second, giving the light a flickering effect. The theory was that this would dazzle enemy troops, but also had the added bonus of protecting the lamp from small-arms fire. Another tool to dazzle troops was the ability to attach an amber or blue filter to the lamp. Coupled with the flashing, this would increase the dazzling effect and could still illuminate targets areas effectively. The system also allows for the use of an infra-red illumination bulb so that IR vision systems can see at night. The field covered by the beam was a 34 x 340 yards (31 x 311 m) area at a range of 1000 yards (910 m). The lamp could also elevate and depress 10 degrees. An excerpt from Mitzakis’ patent application. The device was housed in a special one-man cylindrical turret that was squared off on the left, and rounded on the right. The turret could not rotate 360 degrees as the cabling would snag so could only rotate 180 degrees left or 180 degrees right but not all the way around. The turret featured 65 mm of armor (2.5 in). The operator inside, listed in the vehicle design as “observer”, was positioned on the left side of the turret, partitioned off from the lamp system. The commander was issued with a pair of Asbestos gloves which were used when the carbon electrodes that power the light burned out and needed changing. He also had the role of operation the tank’s only weapon, a BESA 7.92 mm (0.31 in) machine gun, which was positioned on the left of the beam slit in a ball mount. The device was also designed to be employed on small naval vessels. The faithful “Queen of the Desert,” the Matilda II, was now a largely considered outdated and outclassed in the European theatre, and as such there was a surplus of these vehicles. 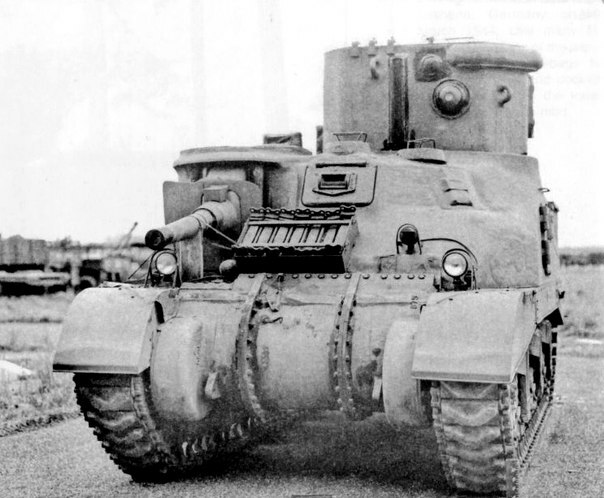 The Matilda II was the first tank to be equipped with the CDL Arc-Lamp turret, identified as the Type B turret. The Matildas were as reliable as ever with reasonable armor, however they were still extremely slow, especially compared to the more modern tanks entering service. As such, the Matilda hull gave way to that of the M3 Grant, which could at least keep up with the majority of Allied vehicles as well as sharing a lot of component parts with other Allied vehicles, making supply easier. Another variant of the Matilda came out of this project, the Matilda Crane. This involved a Matilda using a specially designed crane attachment, that could lift off the CDL or standard turret as required. This allowed an easy conversion, meaning that the subject Matilda could be used as a gun tank, or a CDL tank. The Churchill is the rarest of the CDLs, with no pictorial records whatsoever, barring a cartoon from a newspaper. The 35th Tank Brigade, as well as being issued with Matildas, were also issued with Churchills, forming the 152nd Royal Armored Corps. It is unclear whether these Churchills were ever equipped with the CDL. The turret ring for the Churchill was only 52″ (1321mm) compared to 54″ (1373mm) on the Matilda and the later M3 Grant. The turrets, therefore, were not interchangeable from Matilda or M3 CDLs. Armor on the turret was also increased to 85mm. There is a written record for the existence of the Churchill CDL in the form of a report by a member of the 86th Field Regiment, Royal Artillery, stating that he witnessed Churchills equipped with CDLs deployed on the 9th February 1945 near Kranenburg, Germany. In the long run, the M3 Grant was always the intended mount for the Canal Defence Light. It was quicker, able to keep up with its compatriots, and retained its 75mm tank gun allowing it to defend itself much more effectively. Like the Matilda, the M3 Grant was largely considered obsolete, so there was quite a surplus of the tanks. The CDL replaced the secondary armament turret atop the M3. The M3s, originally, were also fitted with the Type B turret of the Matilda. Later, the turret was changed to the Type D. This welded up some of the ports and openings, but also saw the addition of a dummy gun next to the beam slit to give it the appearance of a normal gun tank. 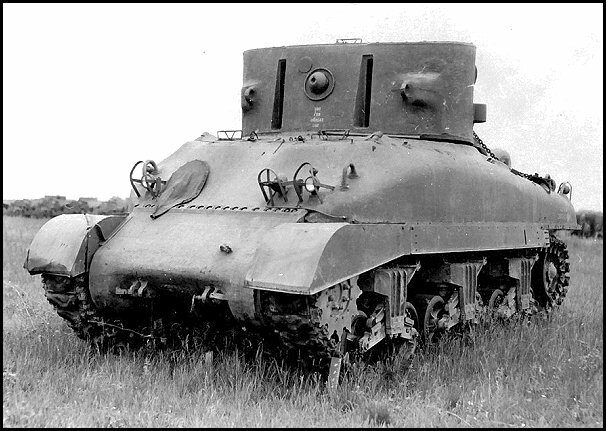 The Americans also tested the M3, known as the Lee in their service, as a CDL tank. The tanks used were mostly of the M3A1 type with the cast super-structure. The turret was mostly identical to the British pattern, the major differences being a ball mount for a Browning M1919 .30 Cal. as opposed to the British BESA. 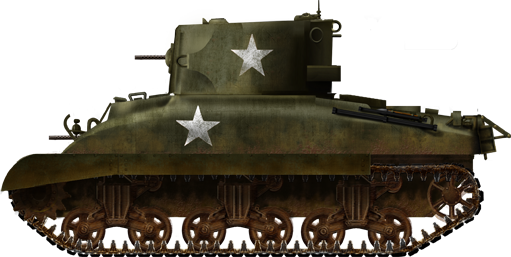 After the M3 CDL, the M4A1 Sherman was the next logical choice for a variant. The turret used for the M4 was much different than the British original, designated the Type E. It consisted of a large round cylinder, that featured two shuttered slits in the front, for two Arc-Lamps. The lamps were powered by a 20-kilowatt generator, driven by a power takeoff from the tank’s engine. The commander/operator sat in the middle of the lamps, in a central sectioned off compartment. In the middle of the two beam slits, there was a ball mount for a Browning M1919 .30 Cal. machine gun. There was a hatch in the middle of the turret roof for the commander. A few were also trialed using the M4A4 (Sherman V) hull. The use of the M4 did not get past prototype stages, however. Matilda CDL of the 49th RTR – 35th Tank Brigade, north-eastern France, September 1944. Churchill CDL, western Rhine bank, December 1944. 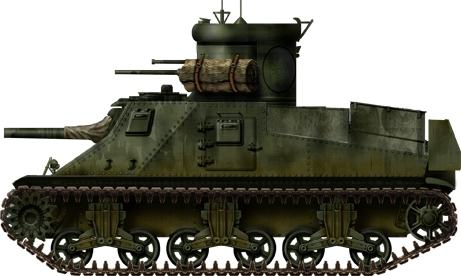 M3 Lee/Grant CDL, other wise known as a “Gizmo”. Medium Tank M4A1 CDL prototype. As it would happen, the Canal Defence Lights saw extremely limited action and did not operate in their intended roles. Due to the secret nature of the CDL project, very few armored commanders were actually aware of its existence. As such, they were often forgotten and not drawn into strategic plans. The operational plan for the CDLs was that the tanks would line up 100 yards apart, crossing their beams at 300 yards (274.3 meters). This would create triangles of darkness for attacking troops to move forward in while illuminating and blinding enemy positions. The first CDL equipped unit was the 11th Royal Tank Regiment, formed early in 1941. The regiment was based at Brougham Hall, Cumberland. They trained at Lowther Castle near Penrith at the specially established ‘CDL School’, set up by the Ministry of Supply. The Regiment was supplied with both Matilda and Churchill hulls, with a total of 300 vehicles. British CDL equipped units stationed in the United Kingdom could later be found as part of the British 79th Armored Division and 35th Tank Brigade, they were joined by the American 9th Armored Group. This group trained in their M3 CDLs at Camp Bouse, Arizona, before being stationed in the United Kingdom. They were then stationed in Wales, in the Preseli Hills of Pembrokeshire where they would also train. Back in the UK at Lowther, two more tank battalions had converted to CDL units. These were the 49th Battalion, RTR, and 155th Battalion, Royal Armoured Corps, and were equipped with Matilda CDLs. The third battalion to arrive was the 152nd Regiment, RAC, who were equipped with Churchill CDLs. The 79th Armored Division was the first Canal Defence Light force to see deployment in Europe in August 1944, the other units were retained in the UK. Rather than let the remaining crews sit idle, they were assigned to other roles, such as mine clearance or assigned to regular tank units. In November 1944, Canal Defense Lights of the 357th Searchlight Battery, Royal Artillery provided light for the mine-clearing flail tanks clearing a path for Allied armor and infantry during in Operation Clipper. This was one of the CDLs first uses in the field. The Canal Defence Lights only real action, however, was at the hands of United States forces during the Battle of Remagen, specifically at the Ludendorff Bridge where they assisted in its defense after the Allies captured it. The CDLs were 13 M3 “Gizmos,”, from the 738th Tank Battalion. The tanks were perfect for the task, as they were sufficiently armored to stand up to the defensive fire coming for the German controlled East Bank of the Rhine. Standard searchlights would have been destroyed in seconds but the CDLs were successfully used to illuminate every angle to deter surprise attacks. This included being shone into the Rhine itself (fitting the vehicle’s name), which helped reveal German frogmen trying to sabotage the bridge. After the action, without the need to defend against incoming fire, captured German spotlights took over the role. 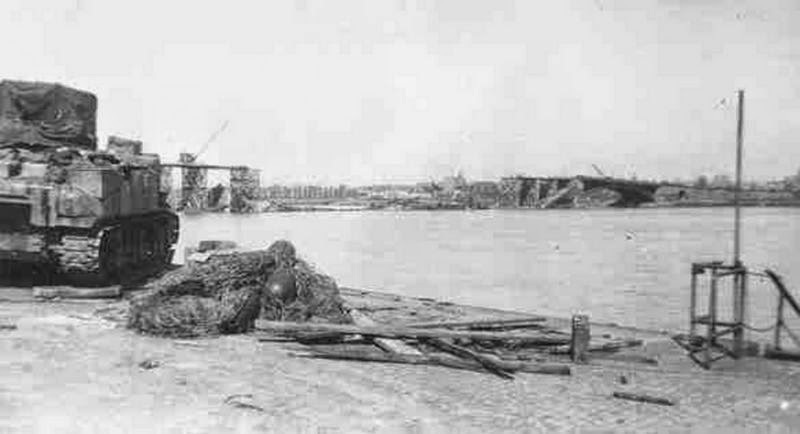 British M3 Grant CDLs were used as their forces crossed the Rhine at Rees. The CDLs drew heavy fire with one of the tanks being knocked out. More were used to cover British and US forces as they crossed the Elbe River Laurenburg and Bleckede. Some Canal Defence Lights were ordered for the Pacific Campaign in 1945 by the US 10th Army for the attack on Okinawa, but the invasion was over by the time the vehicles arrived. Some British M3 CDLs did make it to India under the 43rd RTR and were stationed here for the planned invasion of Malaya in February 1946, the war with Japan came to an end before this of course. The CDLs did see a form of action however, by assisting the Calcutta Police in the riots of 1946 with great success. To no surprise, CDL survivors are rare today. There are only two on public display in the world. A Matilda CDL can be found in The Tank Museum, Bovington, England and an M3 Grant CDL can be found at the Cavalry Tank Museum, Ahmednagar in India. 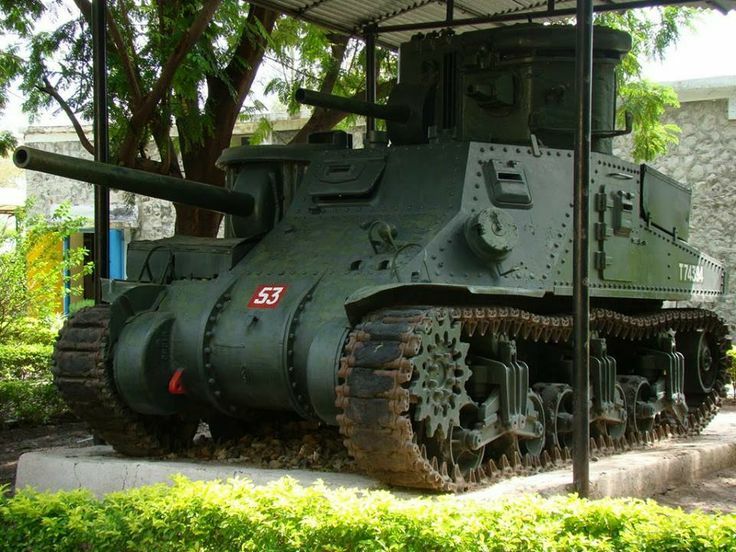 The surviving M3 Grant CDL at the Cavalary Tank Museum, Ahmednagar, India. 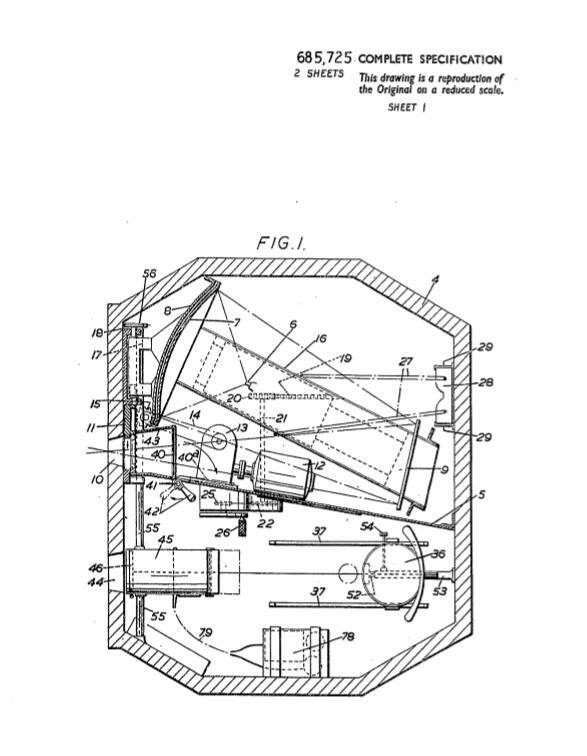 Mitzakis Patent application: Improvements Relating to Light Projection and Viewing Equipment for Turrets of Tanks and Other Vehicles or Ships. Patent Number: 17725/50. That’s very interesting, I don’t remember seeing these used in the war films I’ve seen. Probably not all that relevant to this specific “gizmo,” but in 1952 and ’53 I was a tank commander with Anti-tank Company, 5th Marines, 1st Marine Division in Korea. We were using M46’s. At one time for a short period we had search lights mounted on the turrent just above the 90 mm gun. We weren’t given very clear instructions as to the purpose or function of the light, but in any event, found that they didn’t last very long as they were almost immediately shot out. I was never quite sure who shot them. I think they were not popular with the near-by infantry, perhaps because of our mis-use of them, and the bullet holes were on the side, not the front of the light, where one might expect fire from the Chinese. The lights you speak of are Xenon Searchlights. You could say they were a descendant of the the CDLs. I am not buying this story of the ignorance of the commanders of the CDL system for its little actual use. Much more likely is that the whole thing was a waste of time and resources as proven by the Russians at the Seelow Heights, where they used searchlights to try and blind the Germans, but instead managed to illuminate their own troops making them easy targets for the Germans to pick off !! It’s not the tool it’s the workman. CDLs are a fine idea. Troops are supposed to be in the ‘Cone of Darkness’ not in front of the light. Some of the tactics developed a Camp Bouse were printed in the pages of the FM-17-12 for searchlight equipped M-48s and M-60s. Monty used his to some effect. Other commands could have used them also had they.known about the CDLs. Remember some.if.them didn’t want M-26s either. One of the major drawbacks of the CDL system was that US troops were generally not well trained in night attacks. Only the 104th Division undertook extensive night training. Night attacks were uncommon in any case, and throwing in the complication of an unfamiliar and untried system would have complicated an already difficult operation. Added to this was the fact that darkness always ends – usually not according to plan, and CDL tanks in daylight are just obsolete M3 tanks with an even higher silhouette.